Bonus offer for Suites : Receive the above PLUS $200 onboard spending money! Holland America Line's mid-sized ships are beautifully proportioned. It has spacious public spaces and vast viewing areas with wraparound decks for premium exploration of every scenery. Enjoy service that is always prompt, personalized and endlessly gracious, with room to have a private time and room to engage in a variety of immersive experiences. You can sense the attention to detail once you step onboard - from the gleam of the polished brightwork to the beautiful well thought-out décor. Enoy your journey on a ship large enough to provide a wide array of onboard facilites and activities, and small enough to provide you personalized service in the comfort of your stateroom or in the open air of your private verandah. Cruise in classic Holland America style to iconic cities and discover hidden gems, immersing yourself in the people, places and cultures around the world. Holland America's beautifully appointed mid-sized ships give you that seamless relaxing vacation of a lifetime. Includes Hotel Stay in San Diego! , FREE Drinks Package, Pinnacle Grill Dinner, Low Deposit! FREE 2nt New York City Break , FREE Drinks Package, Pinnacle Grill Dinner, Low Deposit! FREE Hotel Stay In Venice , FREE Drinks Package, Pinnacle Grill Dinner, Low Deposit! FREE 2nt Seattle Stay! , Includes 2 Night Sydney Stay! , FREE Drinks Package, Pinnacle Grill Dinner, Low Deposit! FREE Drinks Package, Pinnacle Grill Dinner, Low Deposit! , Rare Opportunity to See Total Solar Eclipse! Includes a hotel stay in Santiago! , Overnight in Buenos Aires! FREE Hotel Stays in Rome & Ft. Lauderdale! Includes Hotel Stay in Boston! FREE Hotel Stays in Sydney & Auckland! Includes 3nt 4* Central Sydney Hotel Stay , Includes Blue Mountains Tour! 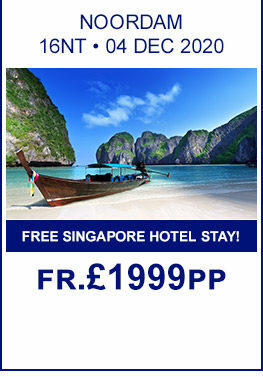 FREE Hotel Stays in Hong Kong & Shanghai! FREE Hotel Stays in Ft. Lauderdale & Montreal! , FREE Drinks Package, Pinnacle Grill Dinner, Low Deposit! 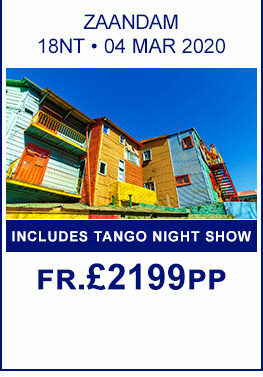 Includes Buenos Aires 3nt Stay! , Cape Horn Cruise! FREE Hotel Stay in Buenos Aires , FREE Half Day City Tour in Buenos Aires! Includes Overnight Onboard In Quebec! 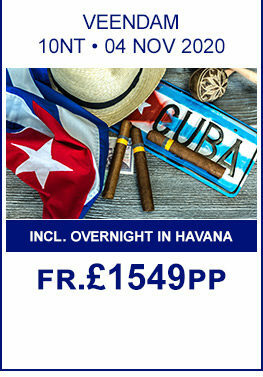 Includes 3nt 4* Hotel Stay! Take in Icy Straight Point and the Inian Islands! , Book a Tour on Maasdam's New Zodiacs! 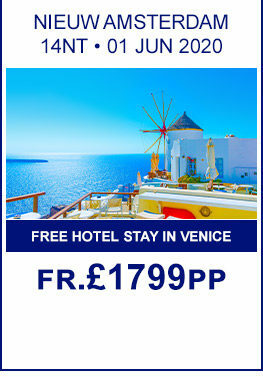 Includes 2nt 4* Hotel Stay In Venice! Holland America Line offers luxury cruising and visits over 473 ports in 14 unique destinations. Europe Where you can discover Russian’s renaissance art, soak in the Celtic rhythms, drink up Bordeaux wines or learn more about human history in the Mediterranean, Black Sea and Holy Land. From the Arctic Circle to Portugal, from Gibraltar to Turkey, overnight stays and one-of-a-kind-excursions give you access to events and sights experienced only by a few. Alaska On an Alaska cruise, you’ll encounter massive tidewater glaciers, iconic wildlife, Klondike Gold Rush history and fascinating Native Alaskan cultures. No matter your Alaska cruise choice, you'll travel to the best places for viewing wildlife and experience scenic cruising along Tracy Arm, Hubbard Glacier or Glacier Bay, your Alaska vacation is a pleasure from start to finish. Asia is a study in contrasts, where yin meets yang, traditional cultures collide with leading-edge technologies and verdant jungles give way to bustling world capitals. This dynamic region, with its rich history and global significance, awaits your exploration on a Holland America Line Asia cruise. Australia, New Zealand & South Pacific have their own special allure. The scenery is spectacular, from New Zealand's jagged, snow-capped peaks to Ayer’s rock, a massive feldspar outcropping in Australia’s desert outback, to the Great Barrier Reef, a living organism so large it can be seen from space. Here the majestic and beautiful collide with the utterly unique. Home to numerous plant and animal species found nowhere else on earth, Australia, New Zealand and the South Pacific are on many traveler’s bucket list—and there’s no better way to experience them than on a Holland America Line cruise. Caribbean Nothing beats the pleasure of relaxing in the Caribbean sun. While ashore, you can discover each island’s unique charms, hidden beaches and the cafes locals love. You can tour the most interesting historical sites and museums, find the best places to hike, bike and snorkel. And when you return to your elegant, mid-sized ship, you can sit back and let the friendly, attentive staff pamper you, or simply dive into any of a wide range of activities, including exploring the many pleasures of cruise dining. It’s your Caribbean vacation and we’re here to make it perfect. Grand Voyage Cruises are extensive and varied, with extended stays that allow for comparisons of cultures and geography. Also, the onboard activities are wide-ranging and designed to enlighten as well as entertain. In the process, cruises to places that were once foreign take on an almost holographic clarity, understood from multiple angles before passing astern as the ship heads toward a new mystery. How curious are you? Join us for a once-in-a-lifetime Grand World Voyage January 22-2019, aboard ms Amsterdam. And allow Holland America Cruises to help you discover not just a new way to travel, but a new way to live. Watch our video and see what Holland America Line has to offer!